Learning Paths | 8x8, Inc.
How to use learning paths? 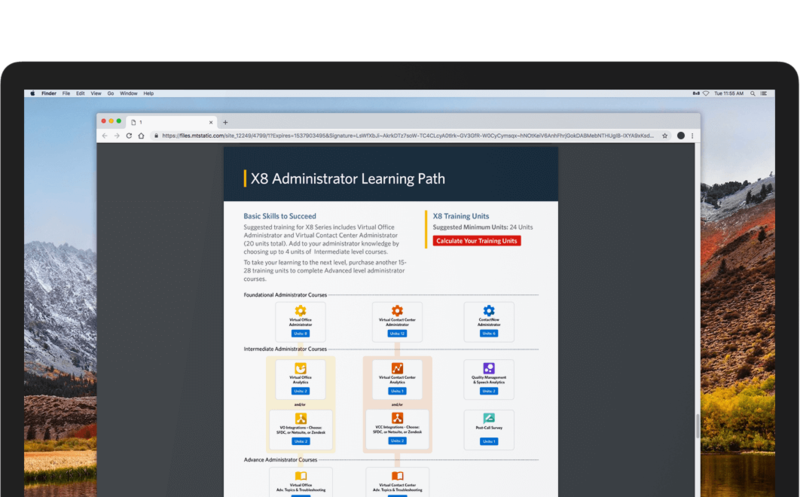 We’ve curated a list of different training offerings based on your X Series package. Learn more about our X Series training. Don’t see your package? Email us at [email protected]. Check out our interactive guide to see what courses you should take or use our calculator to find out how many training units you need to purchase. 8x8 Academy’s X Series courses are offered online and in-person. Depending on your X Series package, you will be assigned a certain number of units necessary to complete your product training. Take a look at our learning paths to learn more. Not sure how learning paths work? What are training units? Do training units expire? Have learning path questions or general 8x8 Academy questions?